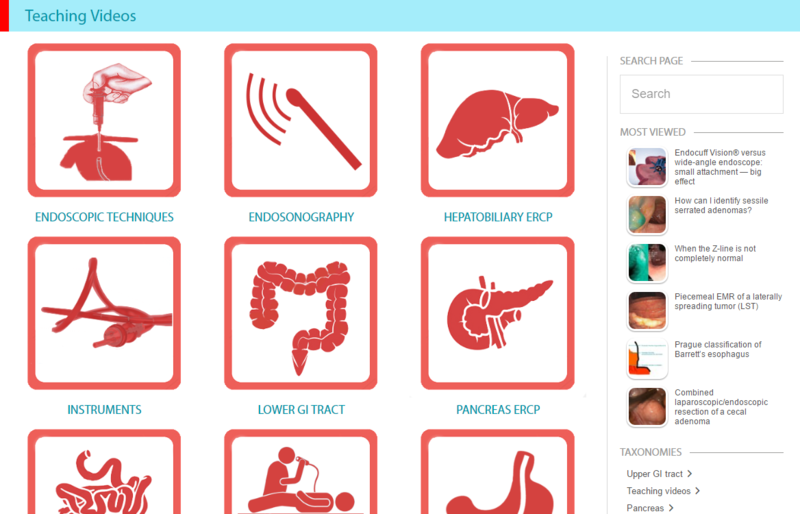 Endoscopy Campus is an online teaching platform for physicians and assistants working in endoscopy. Teaching videos and instructive cases — explaining en-doscopic techniques, for example, or illustrating endoscopic diagnoses — will be included in each of the three different categories for teaching materials. Items to be included in the teaching videos are discussed with the editors, Tho-mas Rösch and Stefan Groth. Contributions can also be submitted freely and are then assessed by the Editors or by external reviewers if appropriate. Around two-thirds of the content of the EC videos is intended to consist of basic endoscopic techniques and cases with tips and tricks, with only about one-third showing advanced techniques and unusual solutions. It is intended that a fee shall be paid (€ 300 per contribution), and contracts will be sent to the authors. In principle, videos can be submitted in any format, but the aim is to have the best possible image quality. Ideally, the videos should be recorded in HD quality and sent uncompressed or with only minor compression. The original material should not undergo any distortion when the edited sequence is being prepared and should always processed at the original size. If the recor-ding material is available in HD, an edited sequence at an image size of 1920 × 1080 px should be set. If the material is SD, then 720 × 576 px should be pre-selected. If the software program used provides defaults, then settings for HD video such as “Apple TV, iPad, iPhone 4 or newer – 720p 25,” “YouTube 720p,” or “YouTube 1080p” can be selected, and the bit rate and resolution should be adjusted if needed. We can offer technical support to a limited extent, but contributions should be submitted in edited form. Final technical processing will be carried out. The videos can be sent online, or on a USB stick, or on a CD/DVD. The teaching videos or demonstration cases should be as short as possible, but as long as necessary! a) Written text for the text to be spoken, adapted to each individual sequence— usually consisting of around 80–90 words per 50–60 seconds. b) The same test, usually slightly shortened, to be placed underneath each of the video sequences as subtitle text — usually consisting of 40–50 words. c) Author details, with institution and e-mail address. This section is intended to present both typical cases and also unusual, interes-ting cases, which will expand over time to form a topic-related endoscopic image library. Introductory text with a maximum of 200 words, with one or two literature re-ferences if needed, to introduce the topic. If there are several examples on the same or a similar topic, these texts may be edited. Three to ten images in HD quality with explanatory text. Author details, with institution and e-mail address. It is intended that a fee shall be paid (€ 200 per contribution), and contracts will be sent to the authors. This section is intended to feature all of the commonly used endoscopic classifi-cations, as well as those that include other parameters, illustrated with example images. 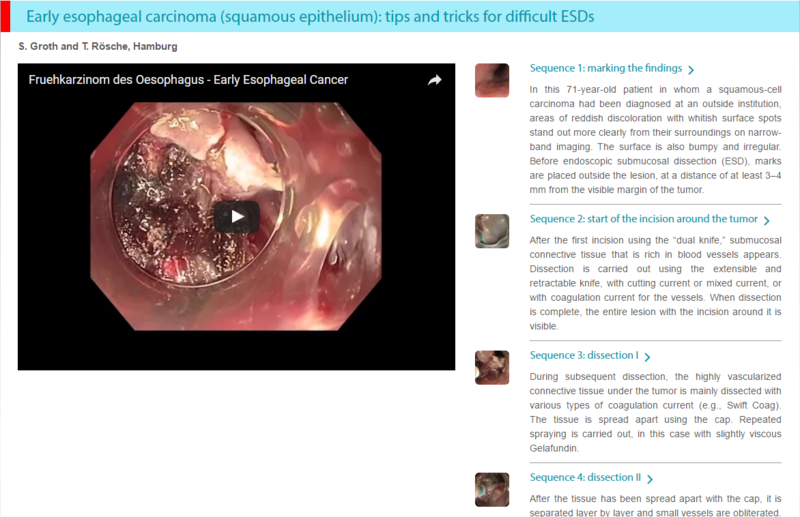 Videos may also be useful in individual cases (e.g., for classifying tumors at the esophagogastric junction). Introductory text with a maximum of 500 words, with three to five literature re-ferences if needed, to introduce the topic. If there are several examples on the same or a similar topic, these texts may be edited. Explanatory schematic dia-grams are a useful addition with most classifications and are expressly requested. Three to five images in HD quality with explanatory text for each subgroup. This section should be regarded as an expanding continuum, so that images by other authors can and should be added later, replacing or supplementing the exis-ting images, at the editors’ discretion. It is intended that a fee shall be paid (€ 200 per contribution for the first contri-butor; additionally introduced images, including those by other authors, cannot be separately reimbursed; € 300 for more elaborate contributions, if videos added by agreement make up a significant part of the presentation). Contracts will be sent to the authors. We kindly ask you to fill in this checklist (pdf) and send it to us together with your contribution.